To "rickroll" is to entice someone to click on a link that unwittingly leads them to a clip of Rick Astley singing "Never Gonna Give You Up." 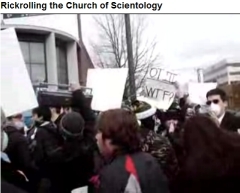 It was attempted, IRL as the kids say, at one of those ridic "anonymous" Scientology protests last weekend. Retarded and awesome clip below.